Community Health Centers are non-profit clinics that are located in medically underserved areas. They serve over 22 million people throughout the 50 states and U.S. territories. These centers play an important role in delivering healthcare for vulnerable populations and can save money by reducing the need for more expensive specialty care visits, which leads to savings for the entire health care system. Healthcare providers working in Community Health Centers and in other settings needed to be well-versed in a variety of issues, including nutrition and physical activity. Counseling in both of these areas is helpful in managing and treating obesity and other related chronic diseases (diabetes, hypertension, etc.). According to a recent report released by the Bipartisan Policy Center, the Alliance for a Healthier Generation, and the American College of Sports Medicine, less than one quarter of physicians feel they received adequate training to counseling their patients on these topics. Several studies have shown that when counseled by their provider to lose weight, patients are more likely to attempt weight loss and increase their physical activity. 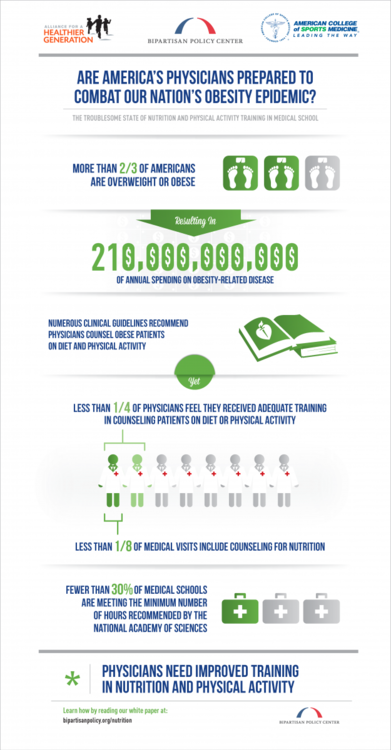 Yet, less than 13% of medical visits include counseling for nutrition. There are several strategies for increasing training in these areas, such as developing a standard nutrition and physical activity curriculum in schools and including more of this content in licensing and certification exams. Some initiatives have already begun to increase training in these areas, but there is still a need to broaden awareness for more changes in medical education. Has your healthcare provider recently given you advice on nutrition and physical activity? If not, would you feel confident asking your provider for advice on these topics during your next visit? If you are a provider, do you discuss nutrition and physical activity with your patients?